2. Plants Biosynthesize and Emit Volatile Organic Chemicals in Response to Herbivory: How Do Plant–Plant Signals Emerge? 4. The Evolution of Plant–Plant Signals: Has Plant–Plant Signalling Selected for Emission and Perception of Particular Volatile Organic Chemicals? 5. The Ecological Consequences of Plant–Plant Signals: Do Plant–Plant Signals Matter Compared to Other Types of Defence? 2. Plant Holobiome: Do Plant-Associated Microbes and the Host Plant Represent a Superorganism? How Plants Communicate with Their Biotic Environment addresses how plants perceive the presence of organisms (other plants, microbes, insects and nematodes) living in their proximity, how they manage to be attractive when these organisms are friendly, and how they defend themselves from foes. 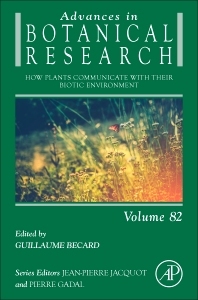 Specific chapters delve into ecology and defense mechanisms, allelopathy and the role of allelochemicals in plant defense, plant signaling, and plant communication with microbes and animals, including herbivores. In addition, the book presents discussions on communication and its role in plant pollination. This comprehensive resource presents tactics that can be taken from the lab, to the bench, to the forest. After studying in Paris, Guillaume Bécard got his PhD at Laval University (Canada) and did a four-year post-doc in a USDA laboratory in Philadelphia (USA). He was then recruited by the University of Toulouse (France) in 1993 as a biology professor. He is studying an ancient and widespread plant symbiosis that occurs between plant roots and certain soil fungi called arbuscular mycorrhizal fungi. This symbiosis enhances mineral and water nutrition of plants and their resistance to environmental stress. With his research team he has contributed in recent years to the discover of the molecular signals and ancestral mechanisms involved in the recognition between the plant and the fungus. He is also involved through industrial collaboration in the promotion of the agronomic use of mycorrhizae to reduce requirements of irrigation, chemical fertilizers and pesticides.